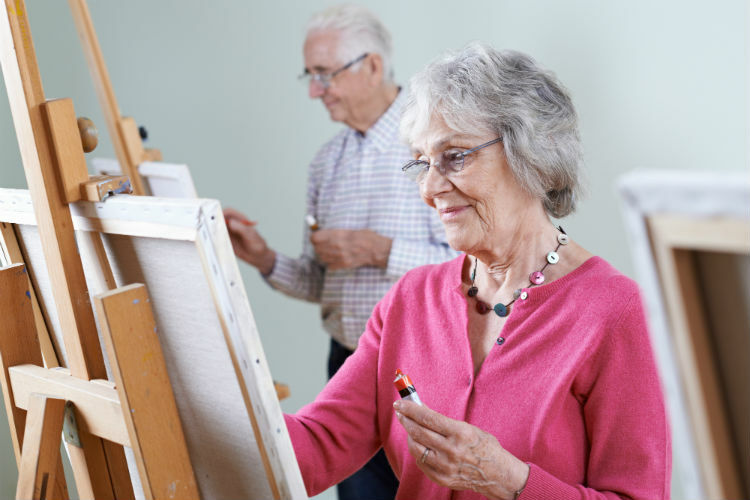 The National Endowment for the Arts and George Washington University conducted a multisite study to measure how participation in weekly art programs affects aging. The study followed over 300 people ages 63-103 and identified several positive impacts of weekly participation in creative arts. If we review the results, we can see how vital it is to participate in creative arts activities weekly as we age. Think of it as another facet of wellness to incorporate into our lives. Just as good nutrition, exercise, and socialization benefit our quality of life and promote independence as we age, likewise, participation in creative and cultural activities promote wellness too. Here are some benefits The Creativity and Aging Study found in those who chose creative art participation. In a two-year study, seniors ranging in age from 63 to 103 who took part in weekly art or cultural programs reported increased or stabilized overall health, while those who didn’t participate declined in their overall health. Amazingly enough, the senior adults who participated in weekly art or cultural programs found that their need to go to the doctor decreased over a two-year period. Of the 300 seniors monitored over a two-year period, those not involved in art or cultural programs on a weekly basis reported a greater increase in the number of prescription medications needed than those who participated in weekly art or cultural programs. That’s a great payoff for enjoying life! The 150 seniors aged 63-103 in the two-year study who did not participate in art or cultural programs weekly had a greater increase in the number of over-the-counter medications used than those who were in weekly creative or artistic programs. The individuals who participated in weekly art or cultural programs reported a decrease in falls, while the people who didn’t participate in such programs weekly reported an increase in falls. Think of the hassle saved from not falling! Realize a fall that results in a broken hip or other bone can take time and money to fix, so why not enjoy art and cultural activities and help prevent falls! A positive impact on morale was seen in those who participated in weekly art or cultural activities over a two-year period. Those who participated in art or cultural programs showed an improvement on the depression assessment, while those who didn’t participate in art declined in the depression assessment. The power of positive engagement in creative or artistic activities point to their effect on health promotion and disease prevention. The arts have a positive impact on helping seniors maintain independence and decrease dependence. Weekly artistic engagement in music, dance, painting, writing, and storytelling improves a senior’s quality of life and translates to better overall health. Strike up the band, sing a medley, swing dance, throw some pottery, paint a watercolor sunset, write a song or poem, and live more abundantly! Lower depression, increase joy and cultivate a positive outlook on life through regular involvement in creativity. Developing creative outlets cultivates a sense of artistic expression, community, and giving. When there is purpose and giving involved, creativity is especially inspired. Paint ceramics at Tulsa’s The Purple Glaze and learn how rewarding creativity can be. Take an eight-week class in acrylics, drawing, or portrait painting at Tulsa Art Center, where some of Tulsa’s finest artists inspire and instruct students of all ages to reach their creative goals. Compete in Broken Arrow’s annual “Chalk It Up” competition, where artists of all ages take to the pavement on Main Street, where they fill their allotted space with beautiful artistic expressions while vendors line the street with unique hand-made items for sale. Tulsa’s Allstar Ballroom Dance Company provides lessons from seasoned dance instructors for students of all skill levels. Find your musical anthem at Anthem Road Academy located on Main Street in Jenks and Bixby. Take weekly music lessons in piano, voice, drums, or guitar. When your family member is ready for senior assisted living arrangements that provide socialization, as-needed care, independence, and enriching creative activities, our elegant, state licensed, Tulsa area assisted living community, The Parke, is honored to provide for your needs. Call us today at 918-249-1262 to schedule a tour and complimentary meal.